­You provide us with web site creation, design, implementation and maintenance. Magazine creation, design, photography and print. POS, Exhibition, marketing and advertising design, print and installation. Creativity, great passion and a willingness to listen to the brief; combined with a strong work ethic. Yes, I would and have recommended your work & services to my colleagues and clients. Simply because you combine great creativity and flair along with a drive to get the tasks completed. Overall a very positive working experience for over 10 years and sincerely a great working partnership. Thank you. 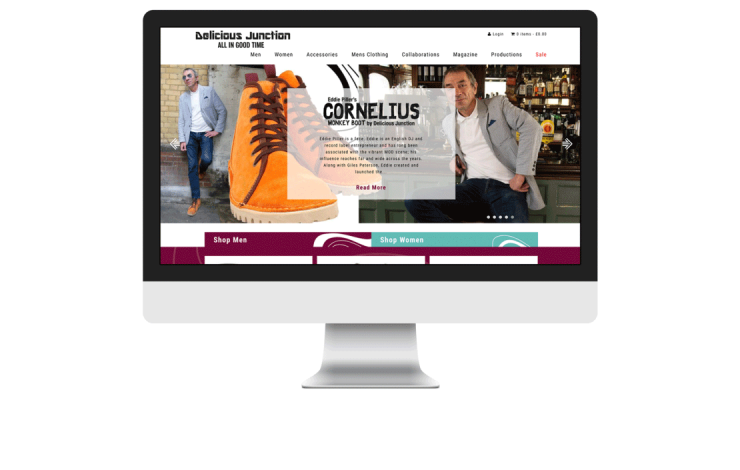 With over 20 years experience in the shoemaking business, immersed in the development, creation and production of footwear for other people and branded houses, Delicious Junction felt that autumn 2010 was the right time to launch the very first collection. The relationship between music and fashion is at the very heart of Delicious Junction, inspired from subcultures that have developed in the UK since the late ’50s & early 60’s, down to influencing today’s trends.